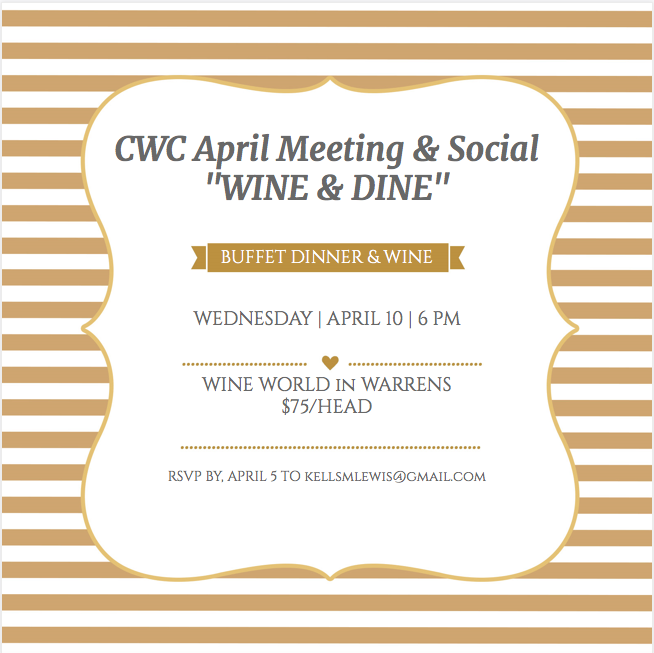 If you haven’t been able to attend any of the CWC sessions we’ve had on a day in the week, here is an opportunity to “Wine & Dine” with Members at our April 10th Meeting. We will start at 6 p.m. at WINE WORLD in Warrens with a buffet dinner and wine for $75. See the flyer attached! CWC Members will receive a free $10 WBTG Card (Wine By The Glass!) and will also be able to shop at a discount of 20%. Please RSVP by April 5th to Kelly: kellsmlewis@gmail.com to confirm your attendance. Details of the meal and wines will be shared very soon. We look forward to “clinking” a glass or two with you!